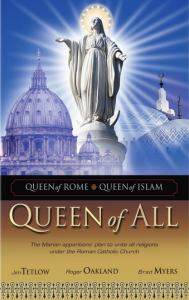 The sub title to this book is “Queen of Rome, Queen of Islam, Queen of All.” The proposition is that Mary worship has engulfed the whole world without anyone realizing it. It is easy to catalog all of the apparitions (so-called appearances) of Mary throughout history and even today. The authors also document how Mary is revered in Islam. They also hold to the position that the harlot woman of Revelation 17-18 is the Roman Catholic church, a view which I have always held, and a view held by many throughout church history. After these general views, however, they begin to see Mary worship in too many things. In the parable of the leaven (Matt. 13), for example, they see Mary in the woman who hid three measures of leaven in a loaf, or also in the woman in the basket in Zech 5. Those stretches of interpretation taint the rest.